The scene of the death of a 40-year-old elephant at the Ban Don tourist area in Krong Na Commune of the Central Highlands province of Dak Lak in early March 2015. A tamed female elephant that carried tourists in the Central Highlands province of Dak Lak for several years died of exhaustion on Thursday, the local elephant conservation authorities reported on Friday. >> Tamed elephant dies in central Vietnam; slash found on body This is the second death of a tamed elephant because of exhaustion while serving tourists in the province so far this year. The animal, named Na Lieng, 43 years old, died on May 7 after being treated for more than a month, Pham Van Lang, deputy director of the Dak Lak Elephant Conservation Center, said. The elephant, owned by the Buon Don Tourism and Trading Joint Stock Company, lived in Krong Ana Commune, Buon Don District. Na Lieng first showed signs of poor health conditions on March 29 when she was unable to stand up again after falling to the ground. Veterinary doctors at the center immediately cared for and treated the elephant before using a crane to help her stand up. Na Lieng was then able to walk and eat but she was still weak. On May 5, the animal fell to the ground again and was given emergency aid and treatment but she succumbed to her critical condition two day later, Lang said The center is coordinating with concerned agencies to examine the elephant’s body to clarify the cause of the death before it is buried, he said. So far this year, five tamed and one wild elephant have died across the country, the center said, adding the herd of tamed elephant in the province has shrunk to only 43. 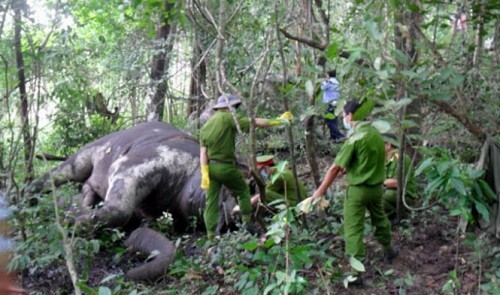 On March 8, the authorities of Krong Na Commune, Buon Don District said that they had received a report on the death of a 40-year-old elephant The animal died of exhaustion while serving tourists at the Ban Don tourist area, according to news website VietNamNet. Another news website reported that the animal met its end while carrying tourists in the site. On March 24, the center received from locals a report that a baby elephant weighing about 100kg had been found dead, with a patch of skin flayed, four feet gone, and a part of the tail cut off, Lang said. The locals discovered the animal’s body in forest subzone 71B, managed by Ea Wy Forestry Company in Cu Amung Commune, Lang said. Local residents said they saw a herd of about 20 elephants in the forest area to search for food a day earlier. On January 15, another tamed elephant, Book Kham, which was 36 years old, fell down a hill and died.